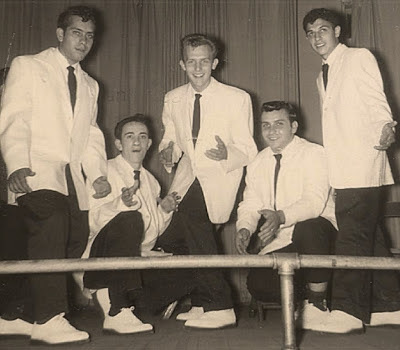 Group from Moneasen, Pensylvania formed in late 1957 by Frank “Pancho” Olivio, Joseph “Khaki Joe” Olivio, John Brown, Anthony “Tony” Fafalios and Dave Reday. They practice with origanl tunes as_Last Summer Kiss/Carol-Ann/Jump Crybaby/White Bucks. 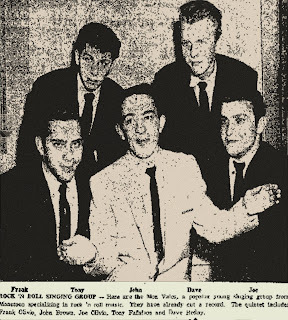 In the mid 1958 the group moved a recording studio in Farihope, Pennsylvania to record their original tunes, as group name for the demo they chose THE MON-VALES by the Mon Valley region. 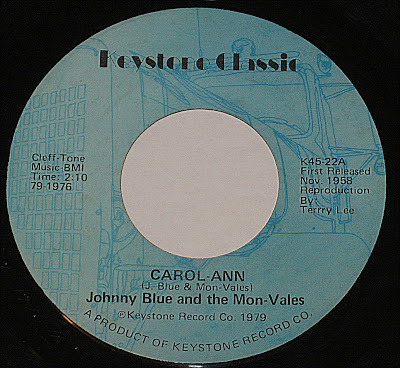 The group send the demos to Pittsburgh / New York companies but without luck, finally all the group moved to New York City Pen Joy label who in October 1958 released the sides_Carol-Ann / (Cool Kat and his) White Bucks. The group promoting their recording in Pittsburgh and Boston at radio stations and have some live perfomances. They returned to home where have many number of shows, in this time the Mon-vales disc was very popular in de Dj stations in the Pittsburgh area but when “Pancho” leave the group this disbanded soon. In 1979 the recording were re-released on the Keystone Classic label as Johnny Blue & The Mon-Vales.